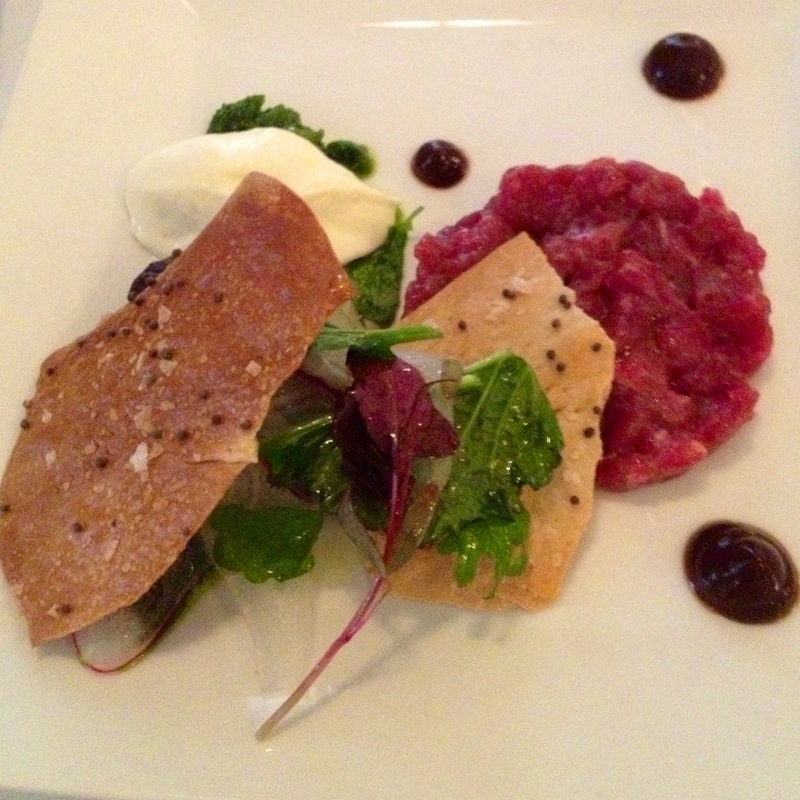 First course: Two Run Farms Lamb Tartare, sweet pea chermoula, whipped burrata, spiced lavash. Chef Michael Gulotta jump-started the meal with some really nice, complex Middle Eastern flavors presented in a very clean, fresh way. Fresh peas, oregano, and cilantro really brightened the whole dish. Maybe a hint of plum (or hoisin?) too. There was a vegan at my table and – no joke – she was the first to finish this dish. And she did so proudly. Second course: Pansotti of roasted purple and golden Covey Rise Beets, foie gras crème, beurre blanc, slightest hint of coffee. This was an expert restraint on what, in clumsier hands, would have been an overly heavy pasta dish. The rich flavor of the foie was elevated by giving it an almost airy texture. I had to pause myself and eat slowly because I almost inhaled this dish in a minute or less. 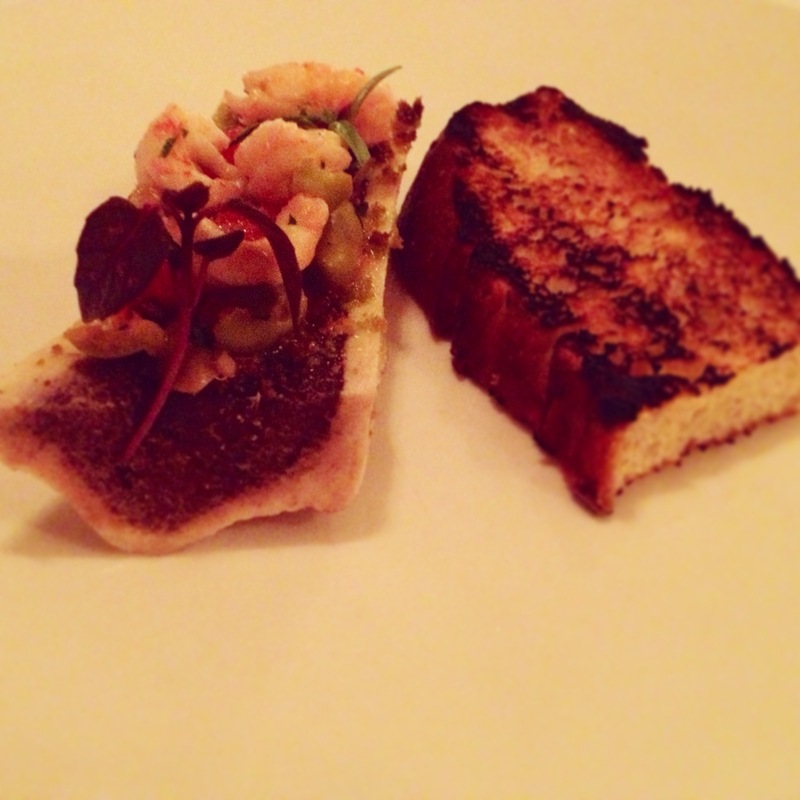 Third course: Green-garlic-crusted Marrow Bone, crawfish salad, blood orange, picholine olive puree, focaccia. Gotta begin by saying this was maybe the most perfectly chopped bone marrow I’ve ever seen. I know that sounds funny, but I’m not exaggerating. Despite bone marrow being so deliciously fatty, the dish was a great balance: The richness of the marrow, the slight briny flavor of the olive and some capers, the sweetness of crawfish, acid from the blood orange. I could go on and on. The focaccia was provided by Lisa White, the pastry chef of Domenica. It was grilled up and perfect for spreading with the marrow. Fourth course: Crepinette of Chappapeela Farms Duckling Breast, popcorn rice boudin of leg, whole green onion, grilled fava beans. A perfectly cooked duck breast, better than most steaks. This was a decent sized dish but deceptively filling. Nice textures, great contrast of flavors. Like pretty much all the ingredients at August, this was sourced locally from a nearby, free-range duck farm. The flavor and texture really shines and is as close to hunted duck as you can get without actually hunting. 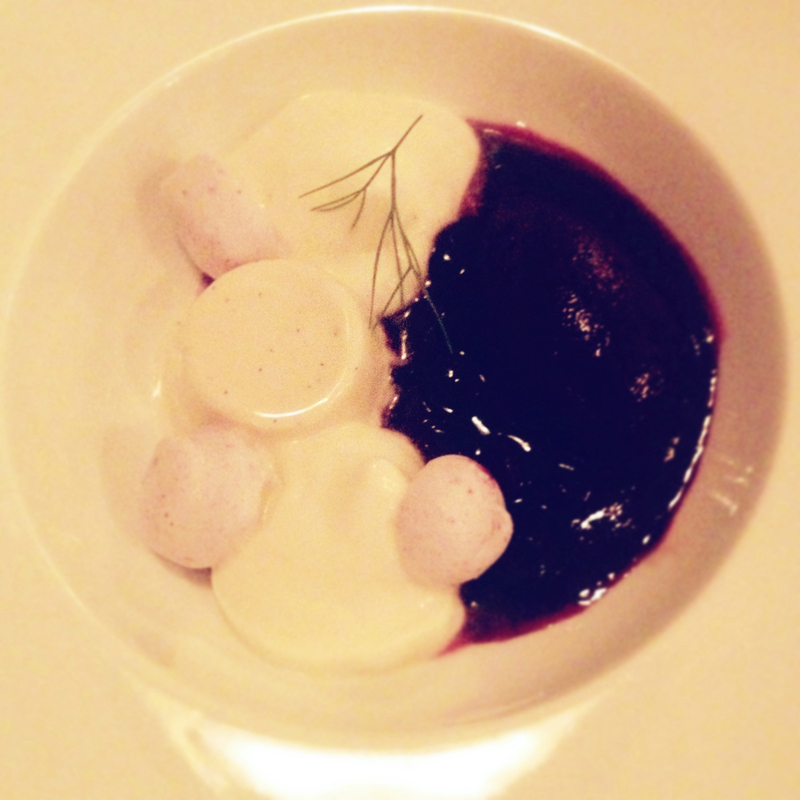 Dessert course: Local Blueberry “Pavlova,” caramelized coconut, lime and blueberry sorbet. I believe I’ve had an iteration of this dessert by Pastry Chef Kelly Fields before, but I will never tire of eating it. Some meringues, some blueberry gelee. Classic dessert flavors elevated and refined without compromising the integrity and flavor of the ingredients—As with all of Chef Kelly’s desserts. 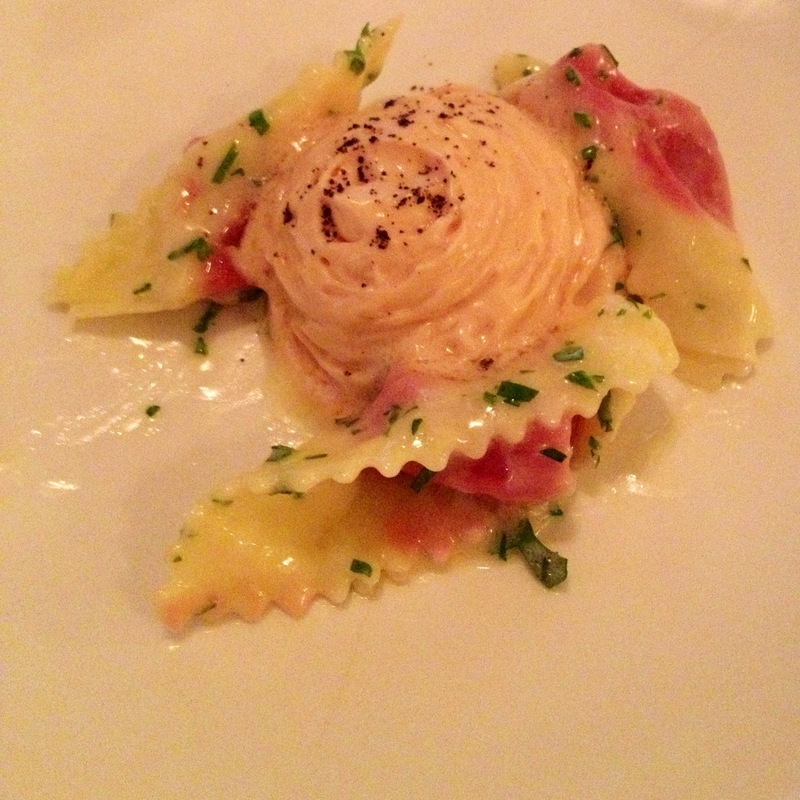 Better pics of most of the dishes available at Chef Gulotta’s instagram gallery. Wines provided by Martine’s Wines and paired by Sommelier Erin. I have nothing left to say other than that it was incredible. I am humbled and inspired by such culinary talent. 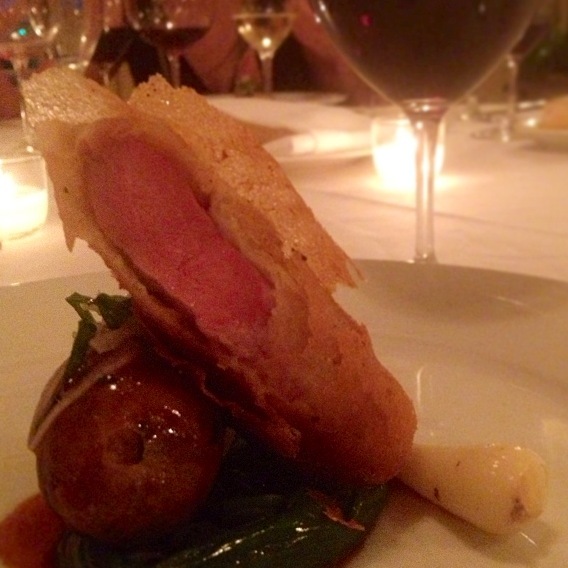 This entry was posted in Food and tagged beet, booze, cheese, duck, foie gras, garlic, marrow, red wine, shellfish. Bookmark the permalink.